Previous version Brave Frontier 1.8.0.1 apk for Android will help you to downgrade or install older app easily. This is one of the best Action apps. We all know that in every good role playing game, there will be something valuable to save (usually, it is a land). The Brave Frontier game is no different. There will be a grand land for you to save and by saving the land, you will win the game eventually. The land to be saved is called the Grand Gaia. The land is a magical land with numerous secrets and powers to be revealed. There is a hidden power in the land that you need to conquer. However, hundreds of strange creatures and fallen gods are guarding the land. They will be your obstacles in winning the game. To help you winning the game, you need to collect valuable items throughout the game. There will be tonics, potions, and also revives to make your journey conquering the Grand Gaia easier. Playing this game is going to need great strategy. You need to know where to get the valuable items, how to get it, how to use it, and eventually how to conquer the Grand Gaia. Considering that this game is making you think while making you having fun as well, the game is flooded by positive feedbacks. Most of the users are satisfied with how well the game is played. That is why the developer and the publisher of this game, A-Lim, is continuing to make improvement of the game. 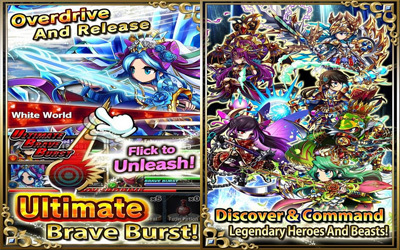 The newest version of Brave Frontier keeps coming and can be downloaded freely. Over 400 legendary heroes and beasts to collect, evolve and summon. All of them beautifully pixel-crafted and with their own battle style and unique Brave Burst attacks! Over a 100 missions in addictive turn-based action-packed combat as you fight tough bosses like Mad God Zebra, Cardes the Malevolent and God of Decay Zurg. PVP Arena mode for strong summoners to combat in! Climb its ranks and cut down your opponents to receive rare equipment and other rewards! Daily and weekly events such as Vortex Gate challenges, special dungeon and heroic tales. Enjoy fresh new challenges every day you log on! This is the only game on my phone, it has a fantastic, addictive, and always entertaining gameplay style.